Perforce Streams offers teams a better way to branch and merge. It intelligently guides developers working in Helix Core –– version control from Perforce. Streams — branches with brains — makes it easy for development teams to visualize how code flows. This is especially useful for projects with a lot of files, binaries, contributors, and changes. Plus, it gives admins an easy way to implement codeline policies for projects. This makes it dramatically easier to onboard new developers to complex projects. Using Streams prevents errors and improves developer productivity. This is especially true for projects with large amounts of code and many contributors. Project managers and other stakeholders can quickly see what work has been completed, and the changes that still need to be integrated. Pending integrations to be incorporated. This guided behavior helps support stability and innovation in your development environments. It also eliminates the work needed to define branches, create workspaces, and manage integrations. To help enforce simpler branching, Streams employs best practice methodologies like the merge down, copy up paradigm. Streams ensures that change flows in the right direction and in the right order. This minimizes project complexity, so developers can get right to work. 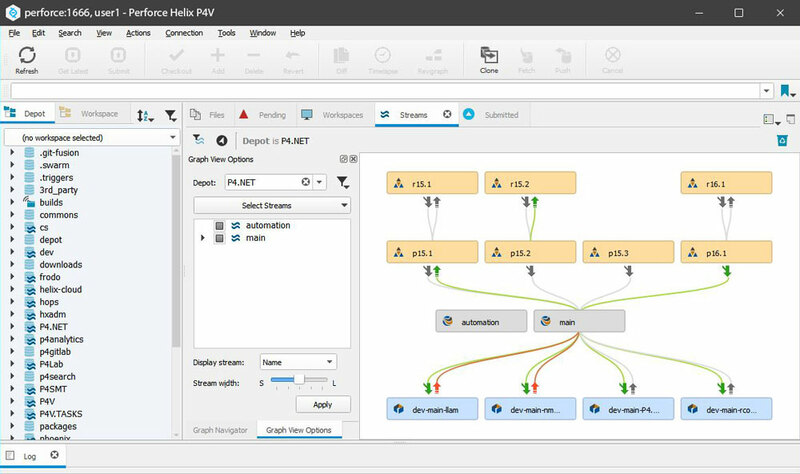 Perforce Streams is available in Helix Visual Client (P4V). It works on Windows, Mac OS, and Linux. Streams is also accessible right from the commandline. Streams also supports plugins for our most popular IDEs, integration tools, and APIs. Perforce Streams helps software teams keeps things simple. With merge and codeline management — as well as a suite of visual tools for complex projects — Streams easily organizes changes throughout your product lifecycle. Perforce task streams are lightweight, short-lived branches. They are designed for developers work on a small portion of a full project branch. So, developers can work privately and switch contexts quickly. The task steam metadata stays in Helix Core, while the changes are merged back into the stream. Serving as a workspace filter, virtual streams allow teams to focus on a portion of the codeline. This is incredibly valuable for enterprises that have hundreds of thousands of files in their code base. You can use them to access to certain files from the parent stream. So, if you only need to work on two files in a project, you don’t need to have the entire stream in a workspace. For Perforce Streams, seeing is believing. Take a guided tour of the graphical tools within Helix Core. You can give development teams greater confidence and accelerate your pipeline. Download now for instant access to the fastest, most secure development platform. Get lightweight branching — free for teams up to 5 users. Sign up for our next demo.